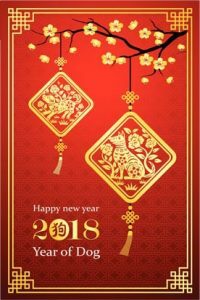 The 2018 Chinese New Year begins on Friday 16th February 2018, celebrations last usually 2 weeks, yet may go as long as a month in some areas of China. 2018 will be the Year of the Dog. The Chinese zodiac moves in a 12-year cycle, so those born in 1958, 1970, 1982, 1994, 2006, and now 2018 were born in the year of the Dog. The Chinese New Year is based on the lunar calendar so the date changes every single year. The Chinese normally celebrate New Year’s between late January and the middle of February. The New Year’s celebrations normally run for two weeks and the festivities are highly traditional and represent the animal the year is named after. This brings us to the second unique aspect of Chinese New Year’s. The Chinese years are often named after animals that belong to the Chinese Zodiac. The Chinese Zodiac runs for a 12-year cycle. This means that every single year in the cycle is represented by a different animal. The year of that specific animal naturally comes once again after the cycle completes an iteration. In 2018, the Chinese are celebrating the Year of the Dog for the first time since 2006. Animals have been part of the Chinese Zodiac ever since the Jade Emperor ordered their inclusion into it. According to Chinese astrological beliefs, the animal that represents the year you were born in has a strong bearing on your personality. Hence, the belief in the Zodiac is very strong and the festivities are in honor of the animal the current year belongs to. Chinese New Year 2018 is being called the Year of the Dog. The dog is the 11th animal in the Chinese Zodiac. Dogs are renowned in the country for their honesty and loyalty. Hence, the people who are born in the Year of the Dog are often considered to be that way as well. One major problem during the Chinese New Year celebrations is the fact that most of the country shuts down for the entire two weeks and in some areas a whole month. This means that most of the export centres and companies in China close shop for the festivities as well. China is the major supplier of manufactured goods all around the world. When considering importing from China, you must plan ahead, so you need to be mindful of this tradition and plan accordingly.